← Celebration Garland: a sewing project for the boy! I’ve fallen hard for the fox trend, y’all. I designed this fox print last year and had some fabric printed at Spoonflower, and since then I’ve made a few garments for the kiddos with it, like this fox skirt for Clementine. 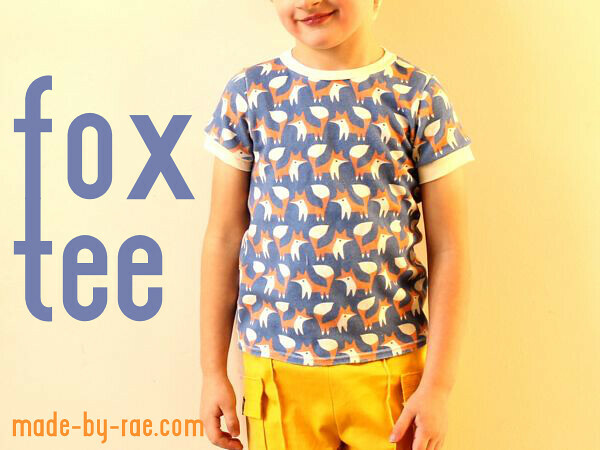 I wanted a design that would work for boys without being too stereotypical (like trucks or baseballs), and, while I love all of the fabric prints that have come out in the past year or so that feature foxes, the vast majority of them really only work for girls. Which is silly, because foxes are an awesome boy motif! Maybe even my favorite right now? I’m not sure. Probably. He wore this tee pretty much non-stop last summer, and, as a result, it’s seen a great deal of wear/washing/fading. I will say, though, that having made somewhere around 5 or 6 tees now for my kids with Spoonflower knit, I found that both turning the garment inside out during washing, and washing on delicate can greatly decrease the fading (something I didn’t do with this tee). I kinda like the fadedness of this one, though; it gives the colors a bit of a retro/vintage feel, and since the print on this tee was pretty bold and modern to begin with, I don’t really mind it at all. You might lose delicate details on a more intricate print, though…something to be aware of if you ever plan to print your own designs with Spoonflower. The other thing is that the prints I have on cotton and poplin from Spoonflower are barely faded at all! Seems the knit is the main culprit. OK, blah blah. If you want me to talk more about Spoonflower, I can. But I can answer specific questions in comments. I used my Flashback Tee pattern, with a short sleeve instead of a long sleeve (tutorial for that can be found here). You guys are LUCKY today, because he did “muscle guy” for these pictures. AWESOME. Yes! Please do a post describing your Spoonflower experience! Love that fox print! Your son looks like he is really getting into this! Great tee! I’ve always had a lot of affection for foxes. He is hilarious! And I LOVE the t-shirt. I’ve been thinking I need to design some knits since I can rarely find just exactly what I want. Thanks for the washing tips. I wish CTB went on forever just so we could keep seeing E’s awesome photo antics. 🙂 Agree about the foxes, too! hahaha, you certainly have a great model! The foxes are very cool. Have you seen this fabric? http://www.fashionablefabrics.com/timber-and-leaf-fox-portrait-in-brown-by-blend-fabrics.aspx It is quilting cotton, but lightweight and very soft…I bought one of the other prints for PJ pants. I really like the whole line. Yes!! I LOVE that timber and leaf line, especially the foxes!! I LOVE the photos you have been sharing. He looks like such a cool kid to hang out with. Also, speaking of your Spoonflower experience, I saw a whale quilt by Land of Nod that looked suspiciously like your fabric??? Do you know about it? Thank you for the info on Spoonflower. I have been hoarding a yard of Heather Ross paper boats on knit fabric. I didn’t want to mess it up. I guess I should still wash it twice before sewing it up. 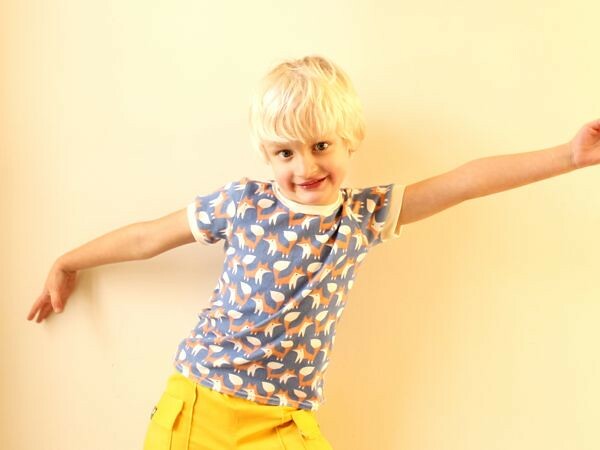 And you are such a great resource for non-stereotypical prints for boys. Thank you! LOVE the foxes….I’m loving that trend too, but had also just been associating them with my girls, but you’re right….perfect boy material right there. That print is ridiculously cute! Did you make the design in photoshop? How did you go about doing that? I’ve always wanted to design a fabric using spoonflower, but I don’t know where to start! Since you said it was ok to ask about Spoonflower, I have a few questions. I’ve read tons of tutorials and even a book about designing your own fabric. But for your fox did you draw out the 1 fox and then use the Spoonflower site to make the rows? Or did you do a little square of several foxes and then put them on Spoonflower? I’ve read of people doing both but no one goes into detail. The tutorials I’ve read seem to spend more time about how to use Photoshop or Illustrator or that free program that you used and I can’t remember the name of. Maybe a Spoonflower post could be in the future. I’m not trying to rush boy time away, as a Mom to 2 boys I’m loving every post. Thanks so much for all you do. All great questions Ginger!! It is possible to make *just* a single fox, upload it to spoonflower, and then use the spoonflower interface to produce the repeat; however I tend to make the repeat in Inkscape (that free one) to see what it looks like, then select a “tile” and upload that one to spoonflower so that it repeats automatically without fussing. But you can do it both ways! Love those photos! And the tee, of course! Love the print and the t-shirt. Oh my! That little boy of you’re is SO CUTE!!! I love this fabric, very unisex depending on how and what you sew with it. This is a fab CTB week, I especially love danas pj’s yesterday, and all your weekend giveaways. Love that print. Perfect colors! So glad you are celebrating the boys, It seems like clothes especially are all about girls. my cutie-pututie deserves some awesome duds too. 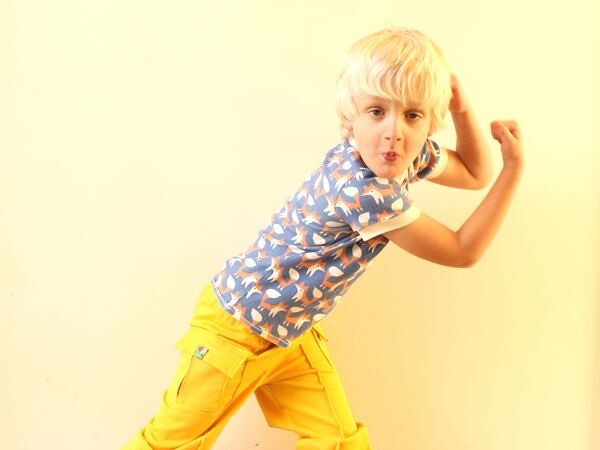 Love the shirt, but I love the way your boy’s personality shines in your photos even more!